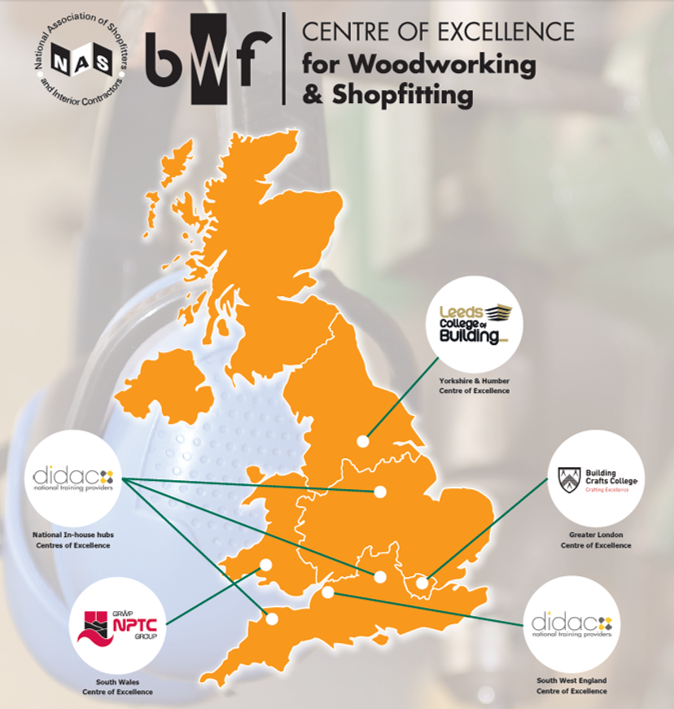 The Centre of Excellence (CoE) Network is an initiative set up by the British Woodworking Federation (BWF) and the National Association of Shopfitters (NAS) to give industry access to high-quality, industry endorsed, and flexible training provision for apprenticeships and other training for the Joinery, Shopfitting & Interior Fit Out industries. The network is made up of FE education colleges and private training providers across the UK, and they are audited by us to ensure the training they provide is of the high standard industry demands to train its workforce. There are continuous feedback loops to ensure they remain at the highest of standards. We ask all our CoEs to work to the latest government-approved Apprenticeship Standards in and provide a flexibility in the curriculum so that apprentices and students receive both the benchmark skills needed for their roles, as well as specific and specialist skills that are unique to each company. • Continuous monitoring, evaluation and feedback of the quality of the teaching and the satisfaction levels of employers and apprentices. Each centre is visited by one of the BWF’s auditors and assessed in the above areas. Regular monitoring to uphold these standards. The CoE network is a pilot, and we are currently undertaking research to establish the demand for expanding the network to other providers across the UK, and constantly reviewing the requirments we expect of our CoEs. We value the college and private training provision that is spread around the country, and we want to provide industry support for them to continue to prosper. Recognising their commitment to quality provision and to working with employers, we promote them as apprenticeship providers and for wider training provision. We welcome applications from all FE colleges and private training providers that are willing to meet the standards above. You will be expected to work closely with the ourselves and employers to provide dedicated support, while delivering the skills needed by the national apprenticeship frameworks and standards. You will be open to auditing of your facilities and working practices, and committed to continuous learning of your staff. If you are interested in becoming a Centre of Excellence, please complete the Sign Up Memorandum of Understanding (MOU). NB: completing this MOU does not automatically grant you Centre of Excellence Status. BWF/NAS will review your application, and have a discussion with you about finalising the agreement. BWF/NAS will countersign this agreement to confirm our intention to progress your application. Following this, an audit will be completed by our Assessor. Further education spending is making many providers look closely as the business case for keeping certain departments going.